Harvest. 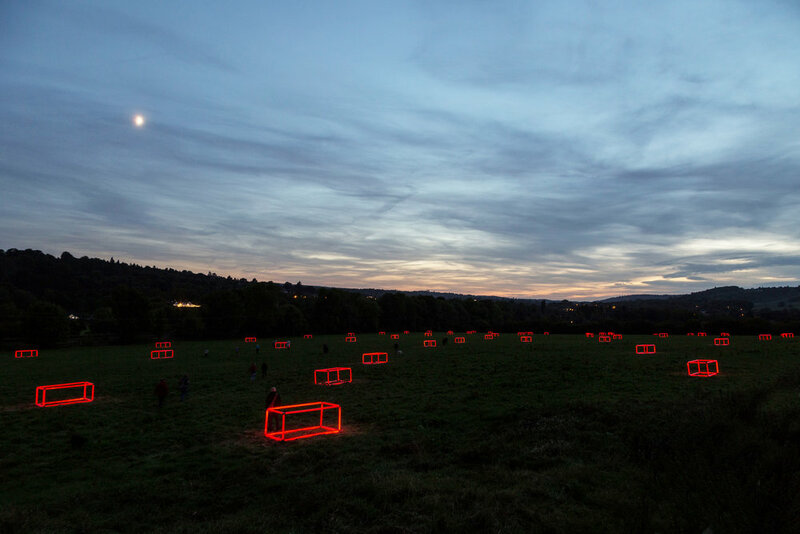 Light sculptures, 300m x 250m field, 66 x LED Bales. Harvest is a site-specific intervention on farmland beneath Box Hill, Surrey. In developing this project, Branson explores the relationship of the local farming community to the land, the processes and rituals of harvest time and the impact of the changing climate on their business. Harvest is an illuminated artwork highlighting some of the unseen work that goes into shaping the landscape that is often taken for granted. Our changing climate has had a particularly damaging result on farming this year, with the drought causing a much-reduced crop. Branson’s installation features sixty-six ‘skeleton’ bales – illuminated outlines, arranged in a farmed formation across the lower field. ‘It’s a rare privilege to be able to create an art work for such a beautiful location. Observing the fields’ harvest cycle has been a real eye opener, seeing the delicate balance faced each season with the increasingly extreme weather conditions. This is the story that has shaped my installation’. Mary Branson, 2018. Engaging with groups of different ages, Mary is sharing this hidden work as well as her own process as an artist. The piece will culminate in a community celebration of the landscape at the Box Hill viewpoint on the 29th September 2018. The celebratory event will include traditional singing from community choirs and a special calling event led by artist Alison Carlier - from the artwork to viewpoint and back. The installation will be lit from 15th-29th September, dusk until 10pm every Saturday and Sunday. The light installation will be visible from Salomon’s Memorial, enabling viewers to see the work from a distance and also at closer proximity through guided night time walks. Harvest - Dusk. John Miller. View from Box Hill. John Miller.